Reading nonfiction is a fantastic way to expand your mind and give you an edge in this world. It’s especially useful when we have a specific idea or concept that we’d like to learn more about. However, it’s important not to over-look everything we can learn from fiction. Fiction resonates with us because it shows us truths about the human condition through great storytelling and compelling narratives. Through an engaging story we can be introduced to big ideas that just don’t resonate the same way in nonfiction: the medium allows for freedom of thought through creativity. With this short book list, we’d like to take a look at a handful of novels that have inspired some truly extraordinary thinkers, especially today’s leaders in technology. Some of these you’re probably already aware of. Some not. But they’re all worth a look. Considered one of Fitzgerald’s greatest works, the novel follows the story of the wealthy Jay Gatsby and his love for Daisy Buchanan during the roaring 1920s. With its focus on wealth, excess, status and privilege some have called this a cautionary tale regarding the great American dream. It’s also just a hell of a yarn. The story paints a spiritual portrait of the quintessential English butler as his world changes from World War I era to the 1950s. The themes of professionalism and dignity versus authenticity are prevalent throughout the novel. Actress and UN Goodwill Ambassador Emma Watson has also cited this book as one of her favorites. “When I was growing up, my family, particularly my father, were very stoic. Part of me is very resentful of this British mentality that it’s not good to express feelings of any kind – that it’s not proper or brave.” She has said she appreciates the book for how it expressed the consequences of this type of discretion. The book that introduced us to the ever loved and ever hated Holden Caulfield. The unique narrative gives us a glimpse into the mind of a 16 year old boy and the events surrounding his expulsion from prep school. Salman Khan, founder of Khan Academy, also lists this as one of his favorite books. The second book centered around a teenager is A Wrinkle in Time, which brings us into Science Fiction. Some of the most innovative ideas of the last two centuries (trains, planes, robots) were considered science fiction at one point and made appearances in stories before they came about in real life. Science fiction is thus a window into our visions of the future, and tells us a great deal about what people of certain eras were both looking forward to and afraid of. A Wrinkle in Time follows high schooler Meg Murry as she travels through space and time on a quest to save her father. The novel uses Meg’s extreme/out of this world situations as a way to explore the very real trials of teenagers. Sheryl Sandberg, COO of Facebook, has called A Wrinkle in Time her favorite book as a child. The sci-fi author Neal Stephenson comes up multiple times in the reading lists of some incredibly successful individuals. Above are three that seemed to come up the most. The novel gives us an idea of what might happen if the world were ending and we were forced to escape to space. If that idea wasn’t interesting enough, the book also shoots forward 5,000 years and has the humans going back to what once was Earth. Larry Page, co-founder of Google, has Stephenson’s Snow Crash in his list of favorite books. That story takes place in a future America where our protagonist Hiro is a hacker/pizza delivery boy for the mafia in reality and a warrior prince in the Metaverse. Stephenson gives us a glimpse of a what a world would look like where much of our time and definition of self is explored in a shared virtual space and effortlessly weaves together concepts of religion, economics, politics, linguistics and computer science. The idea that there can be a book that weaves together an amazing plot as well as some really really profound ideas on philosophy and computer science and technology together, that was, I think one of the first times I had seen a book that had really done this. There were these unbelievably informational pieces. It’s also an unbelievable fun read. I’m a big fan of most of Stephenson’s work. I love his stuff, but I would say Cryptonomicon was one in particular that really demonstrated that you could do this kind of thing together. Isaac Asimov was another author who appeared on multiple lists, his Foundation Series in particular has influenced an extraordinary number of people. The novel centers on a group of academics (The Foundation) as they struggle to preserve civilization during the fall of the Galactic Empire. The story chronicles earthling Arthur Dents’ amazing voyage through space after he escapes the destruction of Earth. It’s interesting to note that Musk happened upon the book at a time that he says he was going through and existential crisis (between the ages of 12 to 15). He first turned to Friedrich Nietzsche and Arthur Schopenhauer but found what he needed through Douglas instead. Salman Khan, founder of Khan Academy also lists this as one of his favorite books. This is in no way an exhaustive list of fiction that has influenced people whom we admire, but we hope that it has inspired you to find more places for those big ideas. Happy Reading! Book Recommendations by the Legendary Washington Post CEO Don Graham – Among his answers are his favourite fiction and non-fiction books and the book that will stay with him forever. A Short List of Books for Doing New Things – Andrew Ng thinks innovation and creativity can be learned — that they are pattern-recognition and combinatorial creativity exercises which can be performed by an intelligent and devoted practitioner with the right approach. He also encourages the creation of new things; new businesses, new technologies. And on that topic, Ng has a few book recommendations. In a previously unpublished 1959 essay, Isaac Asimov explores how people get new ideas. Echoing Einstein and Seneca, Asimov believes that new ideas come from combining things together. Steve Jobs thought the same thing. What if the same earth-shaking idea occurred to two men, simultaneously and independently? Perhaps, the common factors involved would be illuminating. Consider the theory of evolution by natural selection, independently created by Charles Darwin and Alfred Wallace. The paradox here is that crazy people are good at seeing new connections too, one notable difference being the outcome. As a brief aside, I wonder if people are creative, in part because they are autodidacts rather than being autodidacts because they are creative? The formal education system doesn’t exactly encourage creativity. Generally, there are right and wrong answers. We’re taught to get the right answer. Autodidacts try new things, often learning negative knowledge instead of positive knowledge. When you’re right about connections that others cannot see, you are called a creative genius. When you’re wrong, however, you’re often labelled mentally ill.
A great way to connect things is with a commonplace book. Isaac Asimov received a letter one day from a fellow who wanted to argue with one of Asimov’s essays. Asimov used this short essay to highlight the nuances of being wrong. I didn’t go into detail in the matter, but what I meant was that we now know the basic rules governing the universe, together with the gravitational interrelationships of its gross components, as shown in the theory of relativity worked out between 1905 and 1916. We also know the basic rules governing the subatomic particles and their interrelationships, since these are very neatly described by the quantum theory worked out between 1900 and 1930. What’s more, we have found that the galaxies and clusters of galaxies are the basic units of the physical universe, as discovered between 1920 and 1930. The young specialist in English Lit, having quoted me, went on to lecture me severely on the fact that in every century people have thought they understood the universe at last, and in every century they were proved to be wrong. It follows that the one thing we can say about our modern “knowledge” is that it is wrong. The young man then quoted with approval what Socrates had said on learning that the Delphic oracle had proclaimed him the wisest man in Greece. “If I am the wisest man,” said Socrates, “it is because I alone know that I know nothing.” the implication was that I was very foolish because I was under the impression I knew a great deal. When my friend the English literature expert tells me that in every century scientists think they have worked out the universe and are always wrong, what I want to know is how wrong are they? Are they always wrong to the same degree? 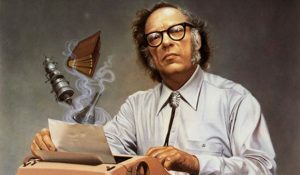 Asimov’s friend, with the mental framing of absolute rights and wrongs, believed that all theories are wrong because they are eventually proven incorrect. But he ignored the degree of incorrectness. There is an important distinction to be made between the degree of wrongness. Because so many scientific theories from bygone eras have turned out to be wrong, we must assume that most of today’s theories will eventually prove incorrect as well. And what goes for science goes in general. Politics, economics, technology, law, religion, medicine, child-rearing, education: no matter the domain of life, one generation’s verities so often become the next generation’s falsehoods that we might as well have a Pessimistic Meta-Induction from the History of Everything. Still curious? Read Kathryn Schulz’s explanation of how we feel when people disagree with us. 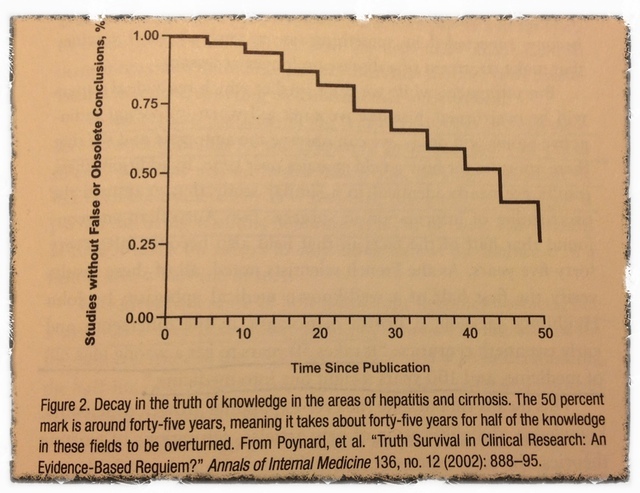 Aslo check out why old knowledge isn’t necessarily a waste.